You can never over-prepare railroads for Winter. Winterization is a painstaking process that needs to be constantly surveyed and managed to ensure that services at your facility do not come to a crunching halt because of accidents, mechanical failures – and of course, unexpected weather. Budget for all the winter equipment you may need, such as jet blowers, portable back-up generators, blizzard coaches that transport crews etc. Winterizing railroads should ideally begin during the months of Fall. 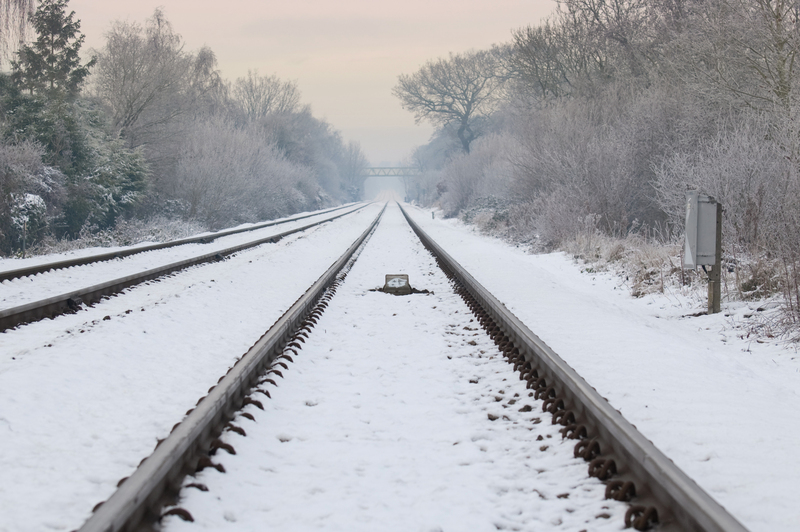 All key areas around the rail tracks and facility should be inspected and repaired if necessary before winter freezes the ground and hides potential hazards under a blanket of snow. Clear out drains and gutters. Standing water can quickly turn into ice and create icicles and other falling hazards during winter months. Cut down high weeds and prune back trees around the railway tracks. Broken bits of a fallen tree, for example, can damage rail switches and disrupt your operations if they’re not cleared out right away. Fences can be built in high-risk locations that suffer from the worst of winter weather, to prevent excess snow from blowing on to the tracks. Gates, locks and moveable bridges that employees operate to serve your facility should be in good working order. Make sure all outdoor lighting is operational. Incidents of slips and falls increase in outdoor work sites during winter, and you don’t want to wait for lowlight conditions and shortened daylight hours to discover that some lights are not functional in areas where your employees are working. Snow should always be removed at least 12 feet away from rail tracks and crossings. Never push snow in between the wheels of standing equipment. Snow can freeze overnight and make switching difficult. Rail tracks are the lifeline of your business. Make sure to clean all switches, derails, frogs and flangeways of snow, mud, wet leaves and other debris that trap moisture and prevent switches from operating smoothly. Use anti-ice fluid and heating strips on line conductor rails to stop ice from piling up and prevent trains from drawing power. For lines that are not in use for long periods of time, “sleet trains” can be dispatched for the sole purpose of removing snow and ice and scattering de-icing fluid on the electrified third rail to keep the line always ready for service. There should be good drainage around switch points and derails. Remove all debris from around and underneath the handle. The handle should operate freely and in both directions. Also have sufficient clearance underneath to allow the handle to fully engage the locking mechanism. The entire length of the tapered rail should be clear of debris. Flangeways at road crossings should have clean grooves. Clearing away all the accumulated mud, dirt and snow from the grooves will reduce possibilities of train wheels derailing. This is something that should also be done right after snow and ice storms. Never allow employees to use their hands or feet to remove debris stuck between the switch points. Use simple clearing tools like broomsticks instead. Keep your ice and snow removal equipment in good, working condition and always have plenty of de-icing supplies on hand. Make sure your facility’s snow removal plan is up to date.